It's not easy to stand out amongst the hustle and bustle of New York City. 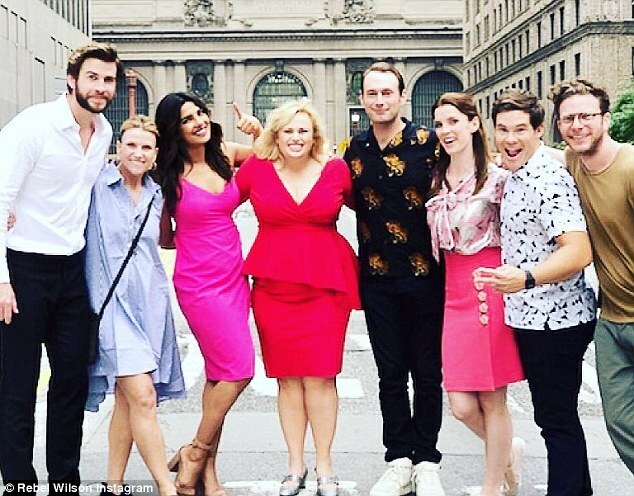 But on this day, Priyanka Chopra, Liam Hemsworth, and Rebel Wilson were show stoppers in the Big Apple. 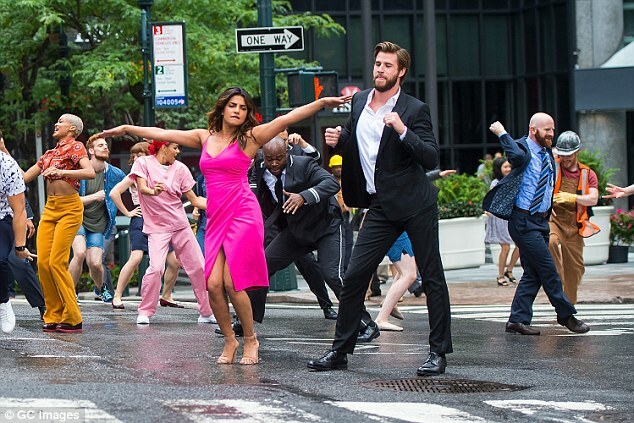 The three stars were spotted dancing in the streets while filming a scene for their upcoming movie Isn't It Romantic on Saturday. 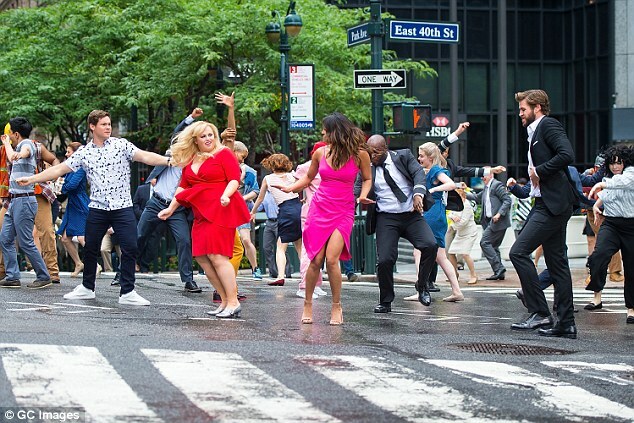 The three stars appeared to be in great spirits as they filmed the choreographed dance routine at the corner of 40th Street and Park Avenue in Manhattan. And they all looked great dressed in formal wear as they busted out their best moves. Priyanka stunned in a pink dress that had a thigh-high slit. Stylists paired it with some brown heeled sandals and had her long wavy tresses open with a part in the middle. Rebel wore an bold red skirt suit that had some cute ruffles at the waistline. 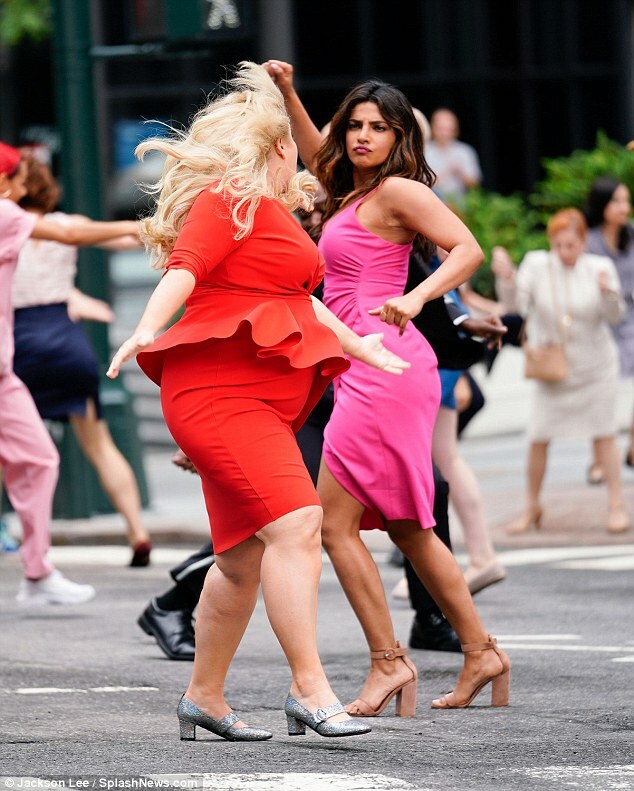 The Pitch Perfect star also had on gray pumps and had some major body and volume added to her long blond locks. As for Liam, he was styled in a traditional black suit with a white dress shirt and his brown hair was stylishly parted slightly to the left. Turns out filming for the movie is about to wrap up. 'Second last day of shooting ISN’T IT ROMANTIC in New York with our leader @straussschulson and producer Gina Matthews,' Rebel shared in an Instagram post on Sunday along with a photo taken on the set. Isn't It Romantic is a romantic comedy that revolves around Rebel's character who's disenchanted with love. She eventually finds herself in the middle of a love triangle with Liam and her Pitch Perfect co-star Adam DeVine. The movie also stars Betty Gilpin, who is best known for portray Dr. Carrie Roman on Showtime's Nurse Jackie. The Todd Strauss-Schulson directed film is set to be released on Valentine's Day in 2019. His resume includes the comedy A Very Harold & Kumar 3D Christmas and the horror comedy The Final Girls.